The Big Day Out is organised by the KidsOut organisation and supported by Rotary International. It first took place over 25 years ago, and since then around 25,000 disadvantaged kids have been taken out on a fun day to places such as Longleat Safari Park where Rotary Clubs from all over District 1200 take kids from their area. 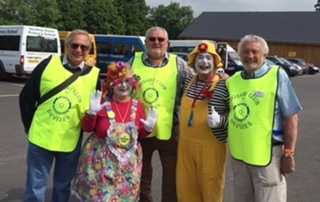 Here’s a ‘photo of the three of us who dared take on the Kid’s Out challenge, together with my favourite clowns – ‘Spoke & Posey’ who I have known for some years! The sun shone all day – hot and humid it was and even more so when Geoff insisted on leading us into the butterfly house and into 100c and 100% humidity! We met the children from Rowdeford School when they arrived, they having first risked the tour of the Safari Park; Downlands School children were clearly everywhere we were not until the very end, when we had the pleasure of a surprise meeting! Geoff, President Alan and I very much enjoyed a day of great fellowship – we enjoyed coffee, coke and ice creams, were greatly amused by Spoke, Posey and company, and finally sailed the Longleat Lake before making landfall back in Devizes by 4pm.